Duck Duck Goose has recently opened in one of the shipping containers in Pop Brixton. Modelled on old school Hong Kong Cha Chaan Teng (tea restaurants), it offers affordable, hearty Canto-Western fare. The retro décor—pegboard walls, low hanging orange butchers lamps, formica booths and mahjong tiles—blends Wes Anderson with utilitarian kitsch. 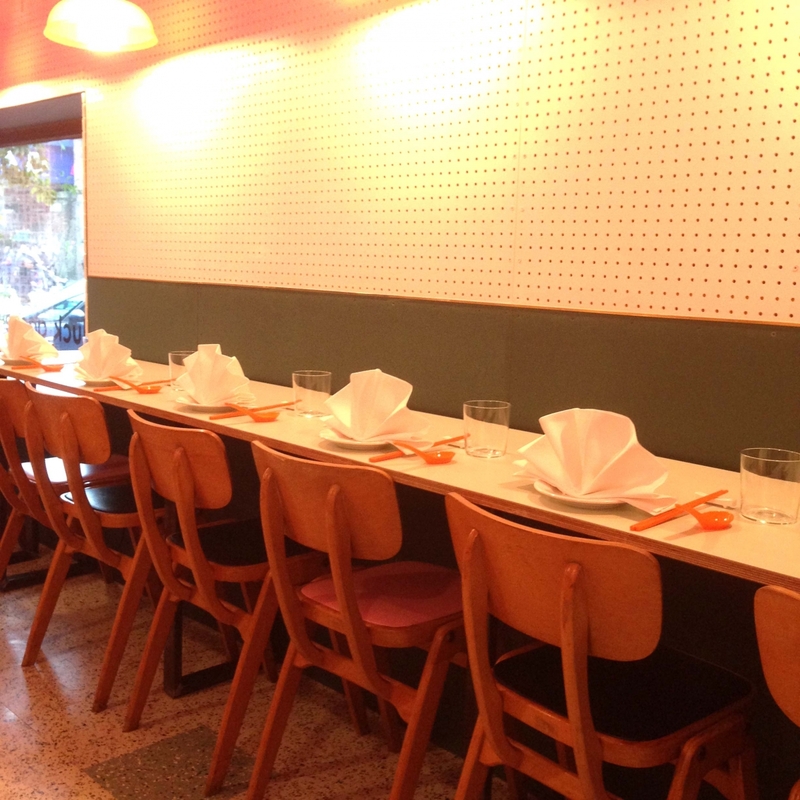 It’s clean, purposeful and subtly stylish—we particularly liked the orange plastic chopsticks and spoons. The layout is precisely engineered within the obvious confines and the place hums with seamless execution. It’s cosy, but that goes without saying. For the most part, this is a carnivore’s haven, although there are a few tempting vegetarian options. The focus is on the eponymous duck and goose, but there are a couple of classic pork and fish dishes too. Dishes are fried, steamed or barbecued in the wok, with welcome wafts of cooking notes filling up the restaurant. The meats are displayed air-drying and roasting in a custom-built air dryer and Dutch oven, adding to the Hong Kong authenticity. A starter of "salt and pepper salsify" kicked off the proceedings, followed by the "prawn toast revisited". The chunks of salsify were deep fried and covered with salt and pepper. Fried garlic slices and red chillies elevated the dish. There was some kewpie mayo on the side for obligatory dunking. The prawn toast was amongst the tastiest we have ever eaten. It was served with curly endive, pickled kohlrabi and bonito flakes and these additions worked harmoniously with the prawn toast, without stealing the show. We would have ordered more of both but knew there was plenty more to follow. The luscious roast duck quarter had flavoursome skin and the char siu (pork collar and belly with five spice), was moist, tender and both were served in their own juices. Accompanying the meats were a pleasing array of pickles, plum sauce and mustard. The turnip cakes with ceps from the “wok” section were served with a hell-hath-no-fury-style hot sauce—the type that makes you sit up and take notice. Choi sum—Chinese broccoli with garlic and soy— balanced all the richness and sweetness from the meats. Feeling very satisfied, we could have called it a day there and but the Cha Chaan Teng French toast with condensed milk and salted caramel ice cream seemed to be calling at us from the menu. When the waiter mentioned peanut butter within the French toast, there was no looking back. Yes, it was rich, but shared comfortably between two it was a memorable sweet note with which to finish off the meal. We left feeling sated, impressed and persuaded to make a return trip. Founder Oli Brown (former head chef of Le Café Anglais and executive sous chef of the Intercontinental Hong Kong) has our hats tipped in his favour for a great concept going in this bijou space. Opening hours: Tuesday-Thursday & Sunday noon-3.30pm, 6.30-10pm; Friday-Saturday: noon-4pm, 6.30-11pm. Closed on Mondays. No reservations.